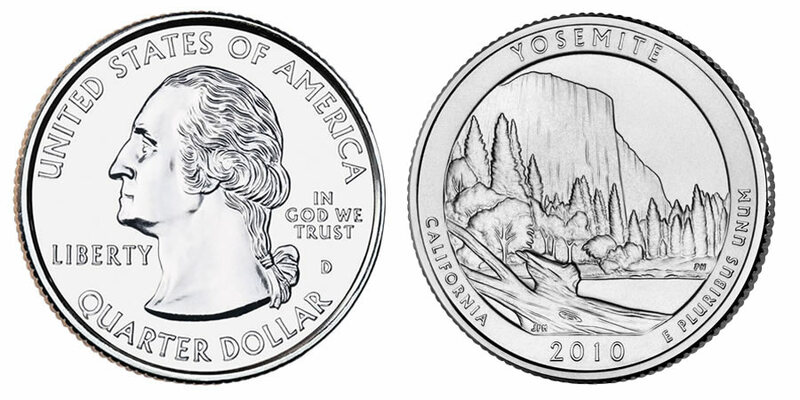 The third coin to be released by the US Mint as part of the American the Beautiful Quarters Program is the 2010 Yosemite National Park Quarter. Final design and release dates have not been made public yet by the Mint. Covering more than 750,000 acres, the Park's pristine scenery is seen by more than 3.5 million visitors a year. The park is also home to hundreds of creatures. President Abraham Lincoln signed a law creating Yosemite Grant back in 1864 in an effort to preserve the area (which he had never personally seen). Unfortunately, the grant left control of the area in the hands of California who did not have the resources or the structure to adequately protect it. Finally, in 1906 President Theodore Roosevelt placed control of Yosemite into federal hands, and then in 1916 the newly created National Park system started overseeing its protection. 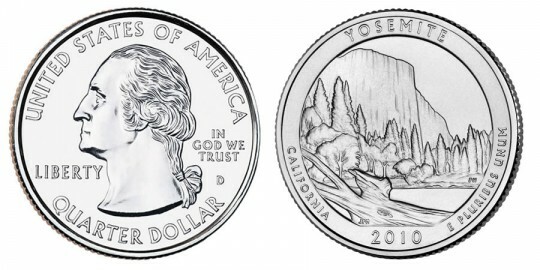 Three inch .999 fine silver quarter dollar bullion coins will also be created by the Mint featuring the same design as is found on the Yosemite circulating quarter. John Flanagan's portrait of George Washington is featured on the obverse of the quarter along with the words "UNITED STATES OF AMERICA," "QUARTER DOLLAR," "LIBERTY", "IN GOD WE TRUST" and the mintmark. The granite cliff known as El Capitan is shown on the reverse and was designed by Joseph Menna and sculpted by Phebe Hemphill. It also contains the inscriptions "YOSEMITE," "CALIFORNIA," "2010" and "E PLURIBUS UNUM."